V-Mon 4000 will be soon replaced by nexoDAQ, please see more details in the News. 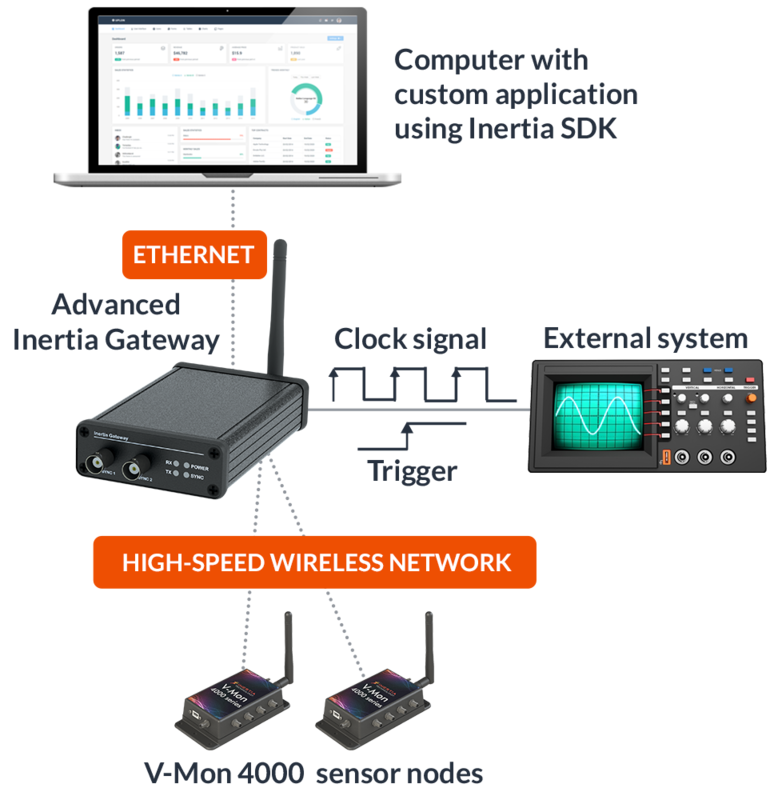 V-Mon 4000 sets a new standard in industrial vibration monitoring, being the fastest wireless network platform on the market. 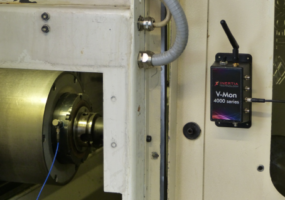 Benefiting from the unique performance of Inertia’s high-speed wireless streaming protocol, V-Mon 4000 can sample and communicate real-time vibration monitoring data from multiple channels at tens of kHz rates. 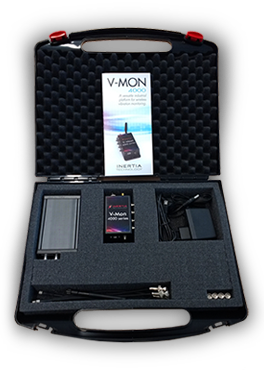 V-Mon 4000 operates in the 2.4 GHz frequency band (license-free worlwide) and achieves 4 Mbps wireless data rate. Multiple sensor nodes can form a network and report vibration monitoring data synchronized within less than 100ns to Inertia Gateway, which is in turn connected via USB to the central computer. Optionally, the data can be stored locally in the on-board SD card and retrieved later over USB or wirelessly. 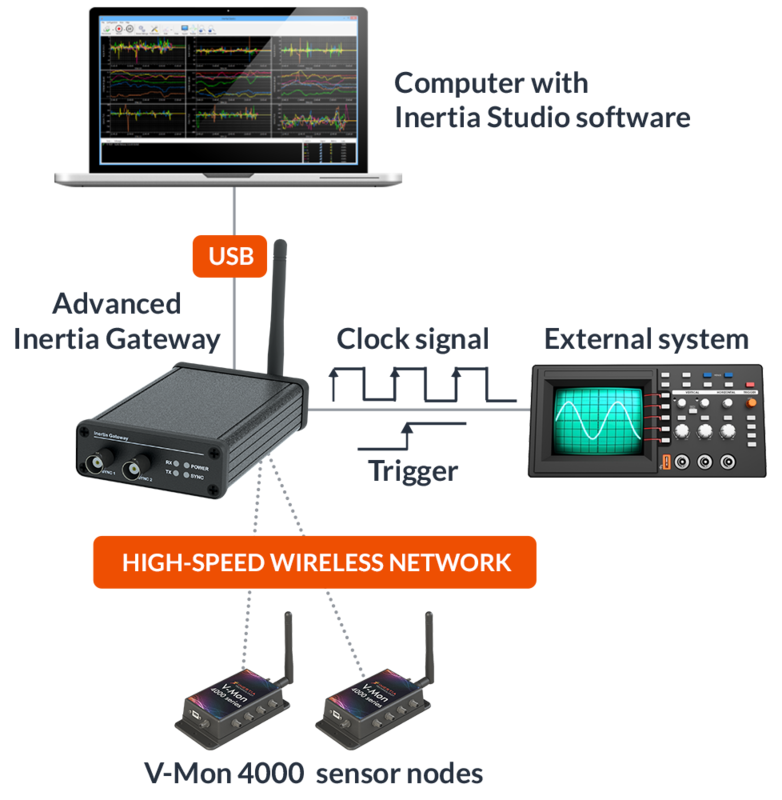 Inertia Studio enables real-time visualization of the sensor data, as well as over-the-air reconfiguration of the sensors and wireless parameters. 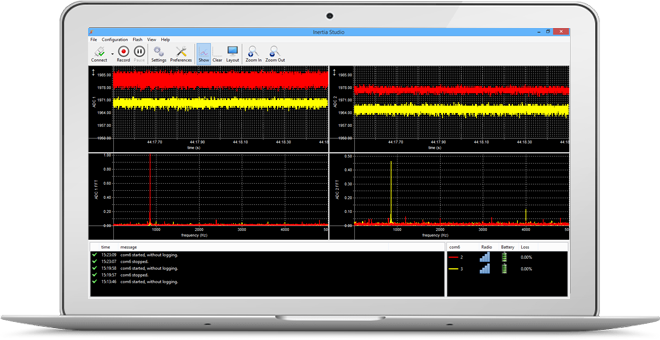 All data retrieved by Inertia Studio is logged for post-analysis and optionally made available for remote TCP/IP connection. V-Mon 4000 has 4 analog inputs, which are compatible with a large range of industrial sensors: IEPE/ICP® accelerometers, charge mode sensors, microphones, force, pressure, tension and strain sensors. 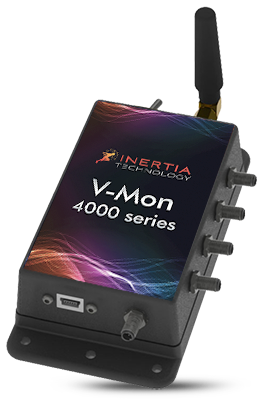 Additionally, V-Mon 4000 features an on-board 3D digital MEMS accelerometer. The powerful on-board ARM micro-controller has an integrated floating point unit, which enables advanced real-time data processing, such as FFT frequency analysis. V-Mon 4000 operates on its internal rechargeable battery and alternatively can be powered from external sources, such as 24V standard industrial, 5V USB charger or energy harvester. V-Mon 4000 is rugged IP67. The module is completely protected against dust and immersion, including all connectors. The computer running Inertia Studio software connects using USB to the Basic Inertia Gateway. 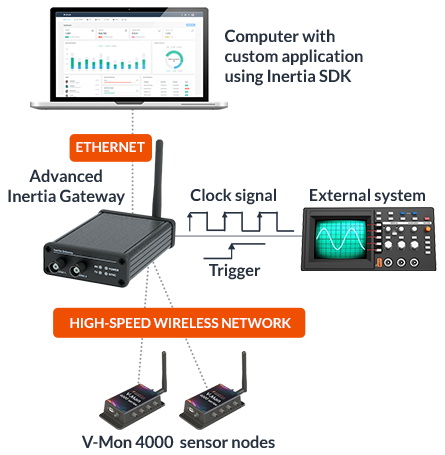 The Gateway manages the high-speed wireless network, composed of synchronized V-Mon 4000 nodes that sample the external analog sensors or the on-board accelerometer. The sampled data is transmitted to the Gateway and from the Gateway to the computer. Inertia Studio stores the sampled data in log files on the computer. Each sample in the log files has a timestamp associated, which precisely identifies the moment the sample was taken. Please contact us for getting a quote. The computer running Inertia Studio software connects using USB to the Advanced Inertia Gateway. 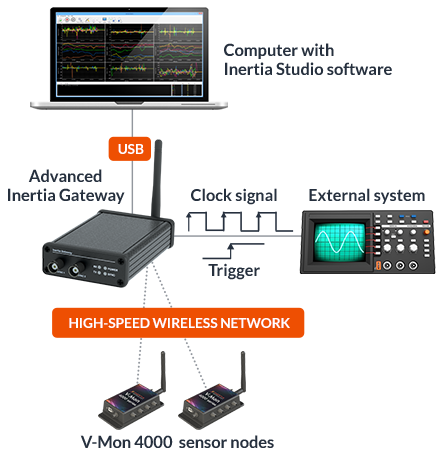 The Gateway manages the high-speed wireless network, composed of synchronized V-Mon 4000 nodes that sample the external analog sensors or the on-board accelerometer. 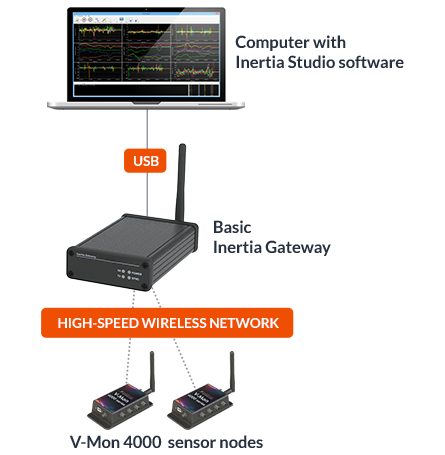 The Gateway can also synchronize the wireless network to external systems. The synchronization signal can be issued by the external system or by the Advanced Inertia Gateway. The synchronization signal can be a trigger for synchronization at the beginning of an experiment, or it can be a periodic clock signal for precise synchronization of sampling instances. Inertia Studio stores the sampled data, pre-computed orientation and trigger events in log files on the computer. Each sample in the log files has a timestamp associated, which precisely identifies the moment the sample was taken. The Advanced Inertia Gateway can be connected using Ethernet to the computer, which allows a better predictability of the end-to-end delay than USB. The Advanced Inertia Gateway can be powered using the AC adapter, providing more flexibility in the physical positioning of the Gateway. 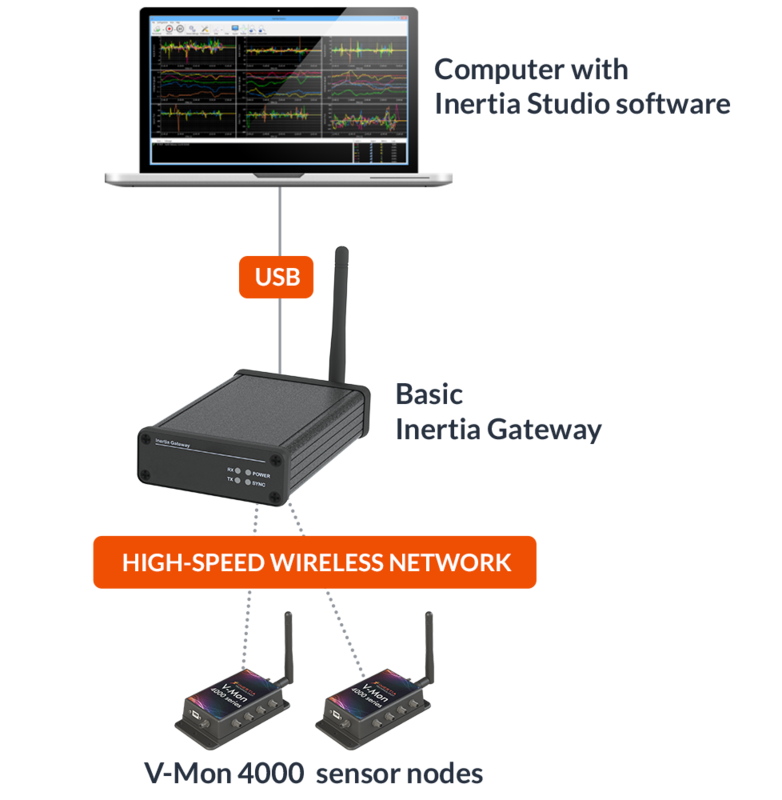 Inertia Studio can still be used for configuration of parameters if the Advanced Inertia Gateway is connected using USB to the computer; the Ethernet connection is to be used only for data collection with custom software. You can customize any of the V-Mon 4000 configurations. Let us know what are you interested in by filling in the form below.